Doing your nails is always in style, and combining nail art with the latest fad is just a natural progression. But a fidget spinner for nail art? Inconceivable! Well, this abstract idea has been put into practice, thanks to British nail professional Natasha Lee. 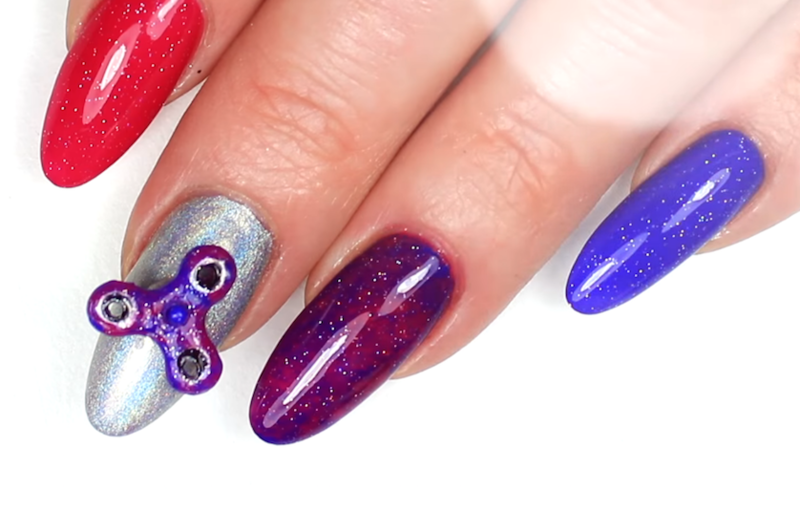 If you’re fascinated by both elaborate nail art AND fidget spinners, then this tutorial is for you. Using Prohesion liquid and powder (which she says is pretty much acrylic), Lee creates a tiny fidget spinner for her nail. If you aren’t into acrylic, Lee also says in her tutorial that you can make a tiny fidget spinner out of paper. Either way, once it’s created, you use a pin, a bead, and some acrylic or nail glue to place the toy on your nail. Even if you hate the divisive fidget spinners, you gotta admit that what Lee has done is incredibly impressive. If you aren’t familiar with the controversy surrounding spinner toys, the issue is that some schools have banned them for being too distracting. Yet, students with mental health issues or attention disorders, like ADHD, actually benefit from their use. While these nail art spinners weren’t necessarily created to be therapeutic, they do actually spin. So they are practical as well as stunning. Beyond using nail polish, Lee even painted her fidget spinner with a top coat that it glows in black light. It’s perfect for black light bowling — although, that would ruin all the work you just put into your nails. This isn’t the first time the fidget spinner has been used in the name of beauty, and we’re sure it won’t be the last. And while we are far more likely to go out and just buy a fidget spinner for our finger, we have to applaud all the effort that went into this elaborate — and fun! — look.